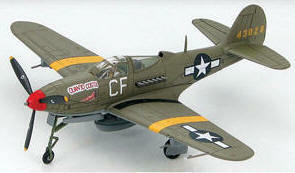 YellowAirplane.com: P-39 Airacobra - P39 Military Propeller Aircraft Model kits, Diecast Airplanes and Wood Models. P-39 Airacobra P39 Military Propeller Aircraft Model kits, Diecast Airplanes and Wood Models.. Plastic Model Kits & Diecast Models. Model Kits, Collectable Plastic Airplane Models of the P-39 Airacobra Military Propeller Aircraft, Diecast AircraftP-39 Airacobra Specifications. Model Kits - The Bell Aircraft P-39 Airacobra has a wingspan of 34 Feet a wing area of 213 Sq. Feet, it is 30 Feet 2 Inches long,12 Feet 5 Inches high, has an empty weight of 5,645 Pounds, a gross weight of 8,300 Pounds. The P-39 uses a Allison V-1710-85 engine which is Liquid Cooled V-12 with 1,325 HP The airplanes top speed is 360 MPH At 15,000 Feet MSL and has a service ceiling of 35,000 Feet MSL. There was one huge problem with the P-39 Airacobra, and that was that there was a door to get into the canopy. When the plane was in flight, the air pressure on the door was so great that a pilot could not open the door to jump out if he need to. A huge design error. Also, the Airacobra had a mid engine and it didn't handle properly, as reported by many pilots. More Information thanks to Roy Seher, There are many versions of this plane, these specs cover only one version. Evelyn, a P-39L Airacobra flown by Lt. Hugh "Rowdy" Dow (who probably achieved the final P-39 victory in the Mediterranean Theater of Operations when he shot down his second Bf 109 in April, 1944) of the 350th Fighter Group, this 1/72 scale, die cast Hobby Master model features engraved panel lines, a detailed cockpit with a removable canopy and pilot figure, a rotating propeller with a 37mm cannon firing through the spinner, optional-position tricycle landing gear, an authentic desert camouflage scheme, and more. 5" wingspan; includes a display stand. Designed around a 37mm cannon that fired through the center of the propeller hub, the P-39 had its engine moved back to the middle of the fuselage, behind the pilot. A replica of a P-39K flown by 5-victory ace Lt. William F. McDonough of the 40th Fighter Squadron "Fight'n Red Devils" (35th Fighter Group) in New Guinea, 1943, this 1/72 scale, die cast Hobby Master model features engraved panel lines; a detailed cockpit with an opening canopy and a removable pilot figure; a rotating propeller with the famous 37mm cannon firing through the spinner; a fuselage-mounted fuel tank; optional-position tricycle landing gear; authentic markings, including "Angelic Donald Duck" nose art; and more. 5" wingspan; includes a display stand. Cobra I, a modified P-39Q that - flown by Jack Woolams of the Skylanes Unlimited Racing Team - was lost over Lake Ontario three days before it was to compete in the 1946 Thompson Trophy race, this 1/72 scale die cast Hobby Master model features engraved panel lines, a detailed cockpit with a removable canopy and a pilot figure, a rotating propeller, optional position tricycle landing gear, an authentic paint scheme, and more. 5" wingspan; includes a display stand. Flying for the Allies after the Italian armistice, the Italian Co-Belligerent Air Force received 75 former 332nd Fighter Group P-39Qs in June and July, 1944.
one of those P-39Qs flown by 4th Stormo, ICBAF, over 1945 Italy, this 1/72 scale, die cast Hobby Master model features engraved panel lines; a rotating propeller with a 37mm cannon firing through the spinner; a detailed cockpit with an opening canopy and a removable pilot figure; wing-mounted machine guns and a belly-mounted fuel tank; optional position tricycle landing gear; authentic markings, including F. Baracca signature nose art (to honor 35-victory Italian WWI ace Francesco Baracca) and Baracca's famous prancing horse (that later became the emblem for Ferrari) on the tail; and more. 5" wingspan; includes a display stand. When the Tuskegee Airmen first entered World War II combat, they were given worn-out aircraft unsuited to the Mediterranean Theater. "Quanto Costa," a hand-me-down P-39 flown by 1st Lt. Samuel Curtis (a recipient of the Distinguished Flying Cross and the Air Medal with oak leaf clusters) of the 100th Fighter Squadron, 332nd Fighter Group, on harbor patrol missions from Capodichino, Italy, in the spring of 1944, this 1/72 scale, die cast Hobby Master model features engraved panel lines; a detailed cockpit with an opening canopy and a removable pilot figure; a rotating propeller with a 37mm cannon firing through the spinner; a fuselage-mounted fuel tank; optional-position tricycle landing gear; authentic markings, including pin-up girl nose art from its previous assignment (probably the 350th FG); and more. 5" wingspan; includes a display stand. This 1/72 scale, die cast Hobby Master model replicates "Snooks 2nd," the P-39Q flown by 8-victory ace Lt. Col. William Shomo (a Pennsylvania undertaker who received the Medal of Honor when he shot down seven Japanese aircraft during a single mission on January 11, 1945) of the 82nd Tactical Reconnaissance Squadron, 71st Tactical Reconnaissance Group, stationed in the Southwest Pacific in 1944. You get engraved panel lines, a detailed cockpit with a removable canopy and a pilot figure, a rotating propeller with a 37mm cannon firing through the spinner, realistic machine guns, an external fuel tank, optional position tricycle landing gear, authentic markings, and more. 5" wingspan; includes a display stand. Made of Philippine mahogany, this 1/32 scale model measures 10¾" in length and has a wingspan of 12¾". Hand painted and detailed, model comes ready to display on the included mahogany base. This wonderfully detailed 1/32 scale die cast model of "Devastating Devil" - a P-39Q intended for service in North Africa that instead joined the 46th Fighter Squadron, 15th Fighter Group, at its home base on Makin Island in the Pacific Theater in 1943 - features engraved panel lines, a detailed cockpit with a glazed canopy and a pilot figure, a rotating three-blade propeller with a 37mm cannon in the spinner, wing-mounted .50 caliber machine guns, retractable landing gear, a sand-colored camouflage scheme with authentic markings, and more. 12" wingspan; includes a display stand. This first-ever 1/32 scale die cast P-39 - Saga Boy II, the P-39Q flown by 357th Fighter Group Commander Lt. Col. Edwin S. Chickering while training in California in 1943 - features engraved panel lines; a detailed cockpit with a glazed canopy and a figure of Chickering; a rotating propeller with a 37mm cannon in the spinner; wing-mounted .50 caliber machine guns; retractable landing gear; authentic markings, including commander stripes around the fuselage; and more. 12" wingspan. A reprint of the official government handbook designed to show the new cadet how to fly the aircraft. Heavily illustrated with all the data. sfbd. This two-part film from 1942 provides instruction on how to fly the Airacobra "N," a low-wing tricycle gear "hot rod" that was designed as a mount for a 37mm cannon. Includes cockpit check, ground handling, takeoffs, normal flight and landings followed by confidence-building maneuvers, two- and four-plane formation flying, aerobatics, gunnery practice, and then combat action. B&W, 1 hour. Purchase the Set and Save 50! P-38 Flight Characteristics & Reconnaissance Pilot. Learn how to fly the P-38 and then take off for an exciting reconnaissance mission! A P-400 (the export version of the P-39 Airacobra) does what it does best: flying down on the deck pounding Japanese ground positions. This P-400 was originally destined for the RAF in the Pacific, but like the others it became part of the 67th Fighter Squadron based at Guadalcanal in 1942. Though it still wears British camouflage, its newly added sharkmouth and American insignia make it clear what unit is dealing out the punishment. 23"x 19" print. Here is a terrific color profile of Lt. McGee's P-39, "Nip Nemesis," accompanied by documentation of Lt. McGee's wartime exploits. Print measures 18"x 12" and is signed by the artist. This hand numbered, limited edition reproduction of an American World War II poster intended to motivate factory workers features a formation of P-39 Airacobras along with the aircraft's Allison V-1710 engine. 16"x 20". Just want to correct a misconception. You have a description of the P-39 and state that the slip stream pressure on the doors of the P-39 made it impossible for the pilot to open them and bail out. The design was called an oversight or design mistake. Not true! Just want you to know that there was a red emergency handle (or lever) on each side of the cockpit fastened above and in line with the door hinges. When the red lever was pulled down the door hinge pins were extracted and then the slip stream easily whipped the door away. With either door gone the pilot need only roll out onto the wing and be swept away -- under the tail (horizontal elevator). With a door gone it was probably the easiest of all fighters to bail from. Certainly far safer than bailing from the highly prized P-51. The French Air Force, restored by the Allies from elements in North Africa, received 165 P-39 Airacobras beginning in April, 1943. Those P-39s initially operated on coastal patrols in North Africa and then flew close-support missions over southern France and Italy until the end of the war. Created by professionals who have painstakingly recreated and modified vintage drawings, this blueprint of the P-39D Airacobra highlights the revolutionary design that placed the engine behind the pilot and the cannon firing through the spinner. Lt. Col. William Shomo, 71st TRS, 82nd TRG, 1944 "Snooks 2nd," the P-39Q flown by 8-victory ace Lt. Col. William Shomo (a Pennsylvania undertaker who received the Medal of Honor when he shot down seven Japanese aircraft during a single mission on January 11, 1945) of the 82nd Tactical Reconnaissance Squadron, 71st Tactical Reconnaissance Group, stationed in the Southwest Pacific in 1944. GC II/6 Travail, French Air Force, 1944 The French Air Force, restored by the Allies from elements in North Africa, received 165 P-39 Airacobras beginning in April, 1943. Those P-39s initially operated on coastal patrols in North Africa and then flew close-support missions over southern France and Italy until the end of the war.